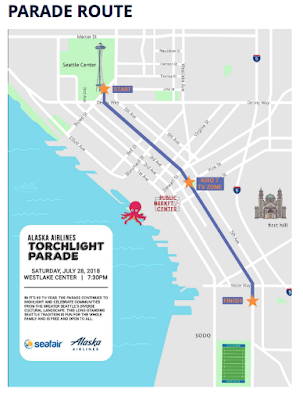 The 69th annual Seafair Torchlight Parade is Saturday, July 28, 2018, starting at 7:30pm. Each year on one magical summer night, thousands of spectators gather to watch as more than 100 parade units march, float and dance in celebration of Seattle. The 2018 Alaska Airlines Torchlight Parade will feature entries from clowns and pirates to drill teams and equestrian units. In it’s 69th year, the parade continues to highlight and celebrate communities from the greater Seattle’s diverse cultural landscape including Children’s Friendship Festival, Indigenouz PlaceMakerz, Sikhs of Washington and many more. The parade begins at Seattle Center and continues down 4th Avenue to South Washington Street. NEW THIS YEAR: a Beer Garden at Westlake Center for parade viewers 21+! This event is free and open to the public, with reserved seating available for purchase online. 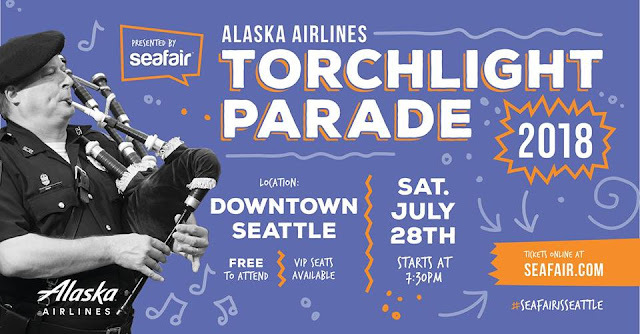 On Saturday, July 28, from approximately 5:00pm until 10:30pm transit service in the Seattle Center, downtown Seattle and adjacent areas will be rerouted with expected delays during the Seafair Torchlight Run and Parade. While most buses that operate on surface streets in the Seattle Center and downtown Seattle areas will be rerouted at some point, riding transit is still the best way to get to Torchlight and other events, as many streets will be closed, traffic will be congested and parking will be limited. Even rerouted buses still go to within 1-2 blocks of the parade route. Using transit service in the downtown tunnel can you through town quickly. Some Torchlight-related transit service revisions started Friday evening when Pine Street closed and bus service was rerouted due to the parade grandstand placement at 4th Ave. The Pine Street closure and associated transit reroutes last until about 3:00pm on Sunday.